Philadelphia 76ers guard Ben Simmons (25) shoots he ball past Charlotte Hornets forward Frank Kaminsky (44) in the first half at Spectrum Center. 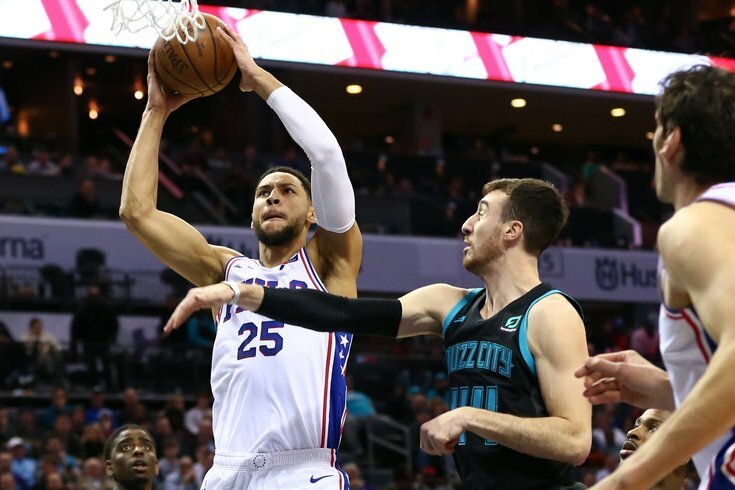 The Sixers made sure to make their game against the Charlotte Hornets as agonizing as humanly possible, but as it turns out, they tend to thrive in these situations. After a Jeremy Lamb shot at the rim bounced out in the game's final seconds, Philadelphia was home free, and their 118-114 victory sets up a big night against the Boston Celtics on Wednesday. • The Sixers could use this version of JJ Redick against the league's best teams in the playoffs. After getting it going against the Bucks on Sunday, it looks like Redick may have finally broken out of his prolonged slump. Several times this season, the Sixers have noted that they can combat teams sagging off of Ben Simmons by running dribble handoffs with Redick. It makes it harder to contest Redick coming around the screen, so the Sixers love to run that action when teams aggressively sag off of Simmons. When Redick has it going, he also makes life a heck of a lot easier for Simmons when he wants to attack. The threat of that handoff has teams overplaying Redick, and Simmons took advantage of that against the Hornets, faking the handoff to set up a parade of open layups and dunks on Tuesday night. When an elite shooter performs like an elite shooter, turns out that is helpful. And Redick did a lot more than just knock down shots — the 34-year-old shooter was taking charges as late as the 4:00 mark of the fourth quarter, and he set a career-high in rebounds. Get it done by any means necessary. • Redick was not the only reason Simmons had an excellent night on the offensive end of the floor. Give the young guy credit — this was one of the best performances we've seen from him as a finisher, with Simmons doing a lot more than just dunking the ball with authority. While the outside world has focused on his jumper, Brett Brown has made it clear from the beginning that the internal goals are much simpler for Simmons. They've stressed improving his free-throw percentage and his finishing ability above all else, and while the results have come in fits and starts, the latter was absolutely sensational against Charlotte. Every time Simmons has a performance like this against a less-talented team, there's a group of people who dismiss it because of the competition. Yes, Simmons' performance against elite teams is more important to their long-term goals. But these sort of games are building blocks, and Simmons has to learn to walk before he can run. It's his second year, and I think it's important to remember that. • Jimmy Butler continued his stretch of getting involved in the game early, and like his head coach, I too believe that getting this version of Butler is going to make or break Philadelphia's season. When he gets going, the Sixers reap the benefits on both ends of the floor, with Butler's engagement level often improving the more he feels involved in the offense. Butler was one of the only guys who decided he wanted to play defense against the Hornets, and they needed that with other integral pieces mailing it in with Boston on the calendar Wednesday. We've been saying for month that his future in Philadelphia will likely be decided by his performance down the stretch, and he has been monstrous as they near the postseason. If he continues at or above this level, the Sixers are going to be a tough out. • James Ennis has reached the "cutting down the nets" stage of winning Philadelphia's version of March Madness. With the rest of his second-unit pals stinking up the joint, it was Ennis to the rescue, which is not a sentence I would have expected to type as recently as two weeks ago. It seems like his stint in Houston playing next to James Harden and Chris Paul really served him well. He understands his role, he plays hard, and shows the proper level of aggression, promoting ball movement without getting too pass happy. And he hit easily his biggest shot since joining the Sixers, nailing a corner three with time winding down to effectively ice the game. • Not a spectacular Tobias Harris game, but a good one, certainly. His ugly misses probably made it feel like a worse night than it actually was — I can't recall a guy who is as good a shooter as Harris is having this many attempts go nowhere near the rim. But aside from those ugly-looking attempts, Harris did his usual Swiss army knife thing on offense, scoring in transition, out of the mid-post, and on simple duck ins throughout the night. And, by the way, it was his big offensive rebound that kept the possession alive in the final minute, only for Ennis to make the game's biggest shot. The little things always matter. • At his best, Ben Simmons is capable of being one of the most impactful defenders in the league. He's big and athletic enough to switch on players up and down rotations, and that makes him dangerous when his engine is up and running. But boy, can he be terrible on that end when he goes into a game and actively doesn't care about that end. It reminds you of times of why people had doubts about his ability there at LSU. Simmons certainly brought his best effort at the offensive end of the floor, but he was caught flat-footed all throughout the game against Charlotte, getting beat by guys as slow as Frank Kaminsky on backdoor cuts. It feels wrong to single out Simmons here, because the entire team mailed it in on defense for a good chunk of the game. And to his credit, at least Simmons was pulling his weight on the offensive end. He had one of his better halves as an attacker in recent memory in the 24 minutes, and you can't say the same about a lot of his teammates. That said, the expectations can and should be higher for Simmons as a defender. He needs to lead by example, and he just didn't seem to feel like it Tuesday. • Philadelphia's bench stunk out loud against Charlotte. Really no other way to put it other than that — they were useless on just about every level on a night where the Sixers needed someone to step up. Boban Marjanovic looked half asleep as guys collected offensive rebounds around him. Jonah Bolden fouled anyone who got within 10 feet of him at the rim and missed read after read on defense. Mike Scott looked like he had a few more courtside beverages after taking a sip of one in Milwaukee. T.J. McConnell committed stupid backcourt fouls on backup Hornets guards 75 feet from the basket. They needed to be better. I don't necessarily care what the scoring margin is between benches, but the Sixers need guys who can fill their respective roles and augment their stars. They didn't come close to doing that on Tuesday. • Let's focus on Bolden for a second, who a lot of people (including me!) advocated for as the team's backup center. The more he plays, the more obvious it is that he's just not going to be trustworthy in any sort of playoff scenario, at least as the guy who needs to anchor a defense. On several occasions, he had absolutely no idea what he was supposed to be doing on a few pick-and-rolls, with Bolden making the opposite read of whatever Sixers "small" was on the other half of the play. Eventually, the common denominator becomes clear. • Mike Scott picked up six fouls in 15 minutes. His only other stat was a single rebound. • I understand this had all the makings of a dreaded "trap game" for the Sixers, bookended by two of the biggest games left on their schedule. Coming off of that big win against the Bucks and with the Celtics looming, it's no surprise the Sixers came out a little lackluster. But it would really be nice if this group would come out every so often and just beat the crap out of teams that are below their talent level. The easiest way to save energy for the second half of a back-to-back is to come out and take care of business early, allowing backups to take you home as the game winds down. This team just can't seem to find that killer instinct early in these games. Whether or not that means anything is up for debate. • The officials were an absolute dumpster fire all night for both teams. I have had to say that far too many times this season.